Just finished KH3 and I've been looking around online at all the Keyblades available in the game (not including the pre-order bonus Keyblades) Do you all expect any of that as DLC? What other Keyblades did you miss? A keyblade created by me. 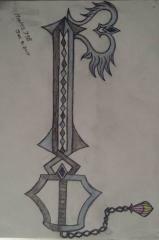 This keyblade was inspired by looking at Xion's Stained Glass. I dedicate this keyblade to Xion, my favorite character in the Kingdom Hearts series. What's up everyone! How's going? Well I'll make short, one, I have finally return home after the holidays spending time with the fam. Now I'm back a home (my little art studio haha) and I can finally go back to my drawings. It's been a long time since I did my fanart KHUx Medal drawings, anyway, I decided to draw my own Keyblade call "Restore Memories." The idea for this keyblade came to me after viewing Xion's Stained Glass picture, so I dedicated this fan art keyblade and drawing to my favorite Kingdom Hearts character and best girl Xion. I hope like my new fan art keyblade, Restore Memories. What Keyblade keychain are you most interested in getting? Triple Wielding or Quadruple Wielding? People in the KH universe are able to dual wield Keyblades if they have two hearts of Keyblade wielders inside of them. It makes you wonder if you could somehow triple wield or even quadruple wield Keyblades if you have 3 or 4 hearts inside of you. Terra-Xehanort had 3 hearts inside of him: Xehanort's, Terra's, and Eraqus', so I wonder if Terra-Xehanort had the ability to triple wield. Probably not though since Eraqus' Keyblade passed on to Aqua and Lingering Will has Terra's Keyblade. As for Sora, not many people realize this, but Sora actually has triple wielded Keyblades in the past. In KH2FM, during the fight with Roxas inside of Sora's heart, you take Roxas' Keyblades and use them against him. You don't physically wield them with your hands, but they float next to you and you most definitely control them. In DDD, it was hinted at that Roxas, along with most of the other Nobody main characters, were able to grow hearts of their own. If Roxas really did grow a heart of his own, then him merging with Sora would mean he would have 3 hearts inside of himself: his own heart, Ventus', and Roxas'. This would most likely allow him to triple wield, which he does during the fight with Roxas. 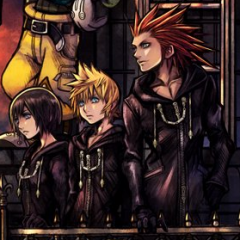 Like I said above, it's hinted at that all the main Nobody characters, along with Xion, have grown their own hearts. If Xion grew her own heart, then her merging with Sora would mean he has 4 hearts inside of him. Would this mean he has the ability to quadruple wield? Who knows. I think it's very possible. Will he ever triple wield again or even quadruple wield? I doubt it since I don't think he or any of the other characters even know that triple wielding or quadruple wielding is a possibility/might be a possibility. What do y'all think? Will they be back again? Will they be usable by Sora? Personally, I think Riku might get Oblivion. He did, after all, use it in 358/2 Days. Not to mention it represents him. I think Kairi will get Oathkeeper, as her charm that served as it's keychain has been returned to her. Oath keeper also represents Kairi. What do y'all think regarding these 2 iconic Keyblades? This is my submission, I had a busy weekend and couldn't do any inking or coloring, but I might come back to this. this is all done in pencil, no tracing only reference photos. 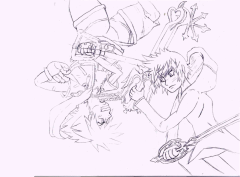 I wanted to draw a scene from the fight between Sora and Roxas, but in my style and with Roxas' face showing. I already have a pre-order of kingdom hearts 2.5 so in the unlikely case that I win (there are some really good works of art for this thing) then I'll be giving it to a friend of mine who couldn't afford to pre-order.